See you in September, see you when the summer’s through? That’s what we may know soon as Derrick Rose undergoes knee surgery Monday, Bulls coach Tom Thibodeau said Sunday before the Bulls played the Clippers. “He’s headed back to Chicago today and will have surgery [Monday],” Thibodeau told reporters. “Then we’ll have a better idea about what the timetable will be. The big part is they won’t know (the severity of the surgery or timetable) until they get in. Everyone has obviously heard that before with Rose’s absence after ACL surgery, which turned out to be all of last season. But last season the Bulls had time to prepare. This time, though some may suggest otherwise, it comes at as a surprise. Kirk Hinrich was to be the backup point guard. Now he becomes the starter again and all the extra effort and time that comes with that. Marquis Teague after little play moves in as primary backup with a depleted backcourt with Jimmy Butler, the other planned starter for the season, still out with turf toe with no return date established yet. So the Bulls move on with all the familiar clichés of having enough to win, next man up and all that stuff. Though there is no next man quite like Rose, as even Clippers coach Doc Rivers was noticing, especially in the first half of the game against Portland before Rose suffered the meniscus tear. Rivers said it’s even a blow for the NBA. He said Chris Paul, who had arthroscopic surgery after a meniscus tear in 2010 and missed two months, came to him right after hearing about injury and was devastated about the injury for Rose. “The players know who the good guys are and Derrick is one,” said Rivers. The process appears to be to examine the extent of the damage once doing the surgery and then determine the appropriate method. It could be anywhere from a few months like with Paul to six or seven months, like with Russell Westbrook this year, both with similar knee injuries. “I don’t want to speculate,” Thibodeau said about the outcome and timetable. “It’s premature. Dr. (Brian) Cole (who did Rose’s ACL surgery), once he gets in there and does whatever is necessary, then we’ll have a better idea. Obviously, the good news is the fact it wasn’t an ACL or MCL. So it’s meniscus. Then there’s a couple of options that they have. They can’t make that decision until they get in there. “I feel that the last three games I thought he played great in the first half,” said Thibodeau of Rose improving as the season was progressing. “He has to shake the rust off. But I think it was more his game conditioning than anything else. The last three first halves were phenomenal. And I think he was getting more and more comfortable. “We want Derrick to do what he has to do,” said Thibodeau. “I feel very good about the personnel we have on this team. We went through this last year. And at the end of the season, we had the belief we could beat anybody. Then we got hit again during the playoffs last year. We have to get that determination back. The important thing is not what other people are telling us. It’s what we think. We have a belief that we can succeed. And that’s what we’re going to do. Which is another week on the road, though the competition lessens somewhat after Sunday. At least on paper as there are no easy games without Rose, or overmatched opponents. But Rivers said, at least early, that could motivate the remaining players to show they matter as well. As a result, the Clippers came out running and shooting. It’s their game, but also under the notion that the Bulls would be not only physically short but mentally impaired with the shock of the Rose loss once again. 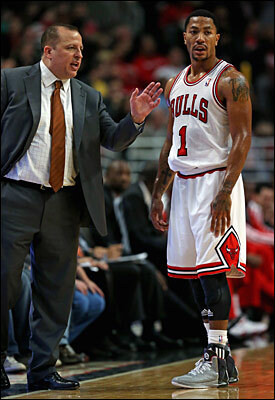 “There’s of course the disappointment for Derrick because of the type of person he is,” said Thibodeau. “He’s such a great teammate along with being a great player. But I think we have an understanding of what we need to do. We can’t feel sorry for ourselves. We have to circle the wagons and get out there and get the job done. You just take things as they come. This is all part of the NBA. Injuries are part of it. That’s why it’s a team. I have a lot of confidence in the guys who are on our bench. They’ve done a good job of preparing themselves. They have to understand what their job is. Get in there and get the job done. “I think his (Rose) mental toughness is going to serve him well,” said Thibodeau. “I think whenever he has faced any adversity, I think his mental toughness has gotten him through. I could tell talking to him last night there was a resolve and determination. We expect him to make a full recovery. It’s another bump in the road. He’ll get past it. “One of the byproducts last season of guys being out was the emergence of Jimmy [Butler],” said Thibodeau, who used rookie Tony Snell in the first quarter Sunday. “At some point, hopefully we’ll be getting Jimmy back, but I thought Jimmy benefited from the playing time. I thought he prepared himself well for the opportunity. I thought he put a lot of work into being ready. I see the work that our young guys are putting in, so I’m confident that they can step up and get the job done. While you’re away don’t forget to write.